What is the basic difference between hybrid seeds and heirloom seeds? Has gardening become a lost art in this technological age? Join Jason Hartman as he discusses the changeover from heirloom to hybrid seeds in our agricultural industry with John Lipscomb, founder of El Dorado Heirloom Seeds, and how growing from hybrid seeds is having a negative impact on our lives. 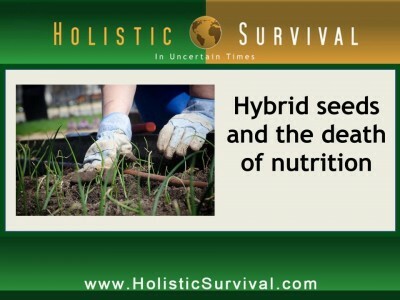 Learn more about the benefits of heirloom seeds and the future of food production at: http://HolisticSurvival.com/category/audio-podcast/. John Lipscomb is the Founder of a family heirloom seed company called El Dorado Heirloom Seeds. He started the business just four years ago with $2,000 and less than a pound of his own garden heirloom seeds which he counted and inserted into envelopes at his dining room table. The company operates on a cash basis with no debt. Today, they employee fifteen people, including the five family co-owners, and are on pace to generate over five million dollars in sales this year with their All-In-One Heirloom Garden Kit. The website is www.EldoradoHeirloomSeeds.com. Mr. Lipscomb has recently written an article called HOW HYBRID SEEDS RUINED AMERICA. Other websites include: www.patriotfood.com and www.bigjohnlipscomb.com. Narrator: Welcome to the Holistic Survival Show with Jason Hartman. The economic storm brewing around the world is set to spill into all aspects of our lives. Are you prepared? Where are you going to turn for the critical life skills necessary to survive and prosper? The Holistic Survival Show is your family’s insurance for a better life. Jason will teach you to think independently, to understand threats, and how to create the ultimate action plan. Sudden change or worst case scenario, you’ll be ready. Welcome to Holistic Survival, your key resource for protecting the people, places, and profits you care about in uncertain times. Ladies and gentlemen, your host Jason Hartman. Jason Hartman: Welcome to the Holistic Survival Show. This is your host, Jason Hartman, where we talk about protecting the people, places, and profits you care about in these uncertain times. We have a great interview for you today and we will back with that in less than 60 seconds on the Holistic Survival Show. And, by the way, be sure to visit our website at HolisticSurvival.com. You can subscribe to our blog which is totally free, has loads of great information, and there’s just a lot of good content for you on the site. So make sure you take advantage of that at HolisticSurvival.com. We’ll be right back. Jason Hartman: It’s my pleasure to welcome John Lipscomb to the show. He is the founder and the president of El Dorado heirloom seeds. And we’re going to be talking today about gardening, urban gardening hopefully specifically and what you can do to be self-sufficient and live off the grid and be self-reliant in terms of your food supply. John, welcome. How are you? John Lipscomb: Oh, I’m fine. And it’s just terrific to be on your show, Jason. Jason Hartman: Well, it’s great to have you. It seems like the powers be, the corporatocracy, Monsanto, etcetera, are trying to control the food supply, the government with this new recent, I believe it’s called the Food Safety Act, is just interfering in our lives more and more. And we’ve got this whole situation with Monsanto and these hybrid seeds. Now what are heirloom seeds and what is the difference, John? John Lipscomb: Oh, great question, Jason. I tell you, a lot of people, I could say about 90% of Americans are unfamiliar with heirlooms, but heirloom seeds are the vegetable seeds that were used prior to the industrial revolution and the turn of the last century. And during that time, the early 1900s, what we had in this country was a need to produce more food cuz our country was growing and everybody was moving to the city for the good paying jobs. And so they went to corporate farming rather than a mom and pop farming, and what they saw is that they needed to produce a more uniform vegetable and something that could be harvested without bruising and go down those conveyer belts and all that mechanized equipment. So what they did is they created hybrids. And hybrid is basically the merging of other vegetables together. So, initially, they were taking heirlooms and taking the best, or what they accounted was the best, of each type. So if they were working on a tomato, an heirloom tomato, they wanted a more round, uniform look, a particular size and a skin toughness. And it kind of forgot what the mom and pop farms were doing which was focusing on quality of food and taste, the health aspect. So over the last 100 years, we now have all this sterile food. And the other downside with these hybrids is that you cannot take the seed from the current crop and replant it and get more of the same. Jason Hartman: That is really amazing and scary that they can stop nature, first of all, like that, but then patent nature. John Lipscomb: Yeah, it’s very disturbing and a lot of farmers say as people look into it there’s a lot of documentaries online about farmers that have lost their farms just because some seed blew across the road onto their field and they accidentally grew patented seeds. So it’s a real mess. And people are starting to wake up and become concerned about the quality of their food. So that drives them into two areas: one, to be organic gardeners and farmers, the other aspect is to go back to the old original seeds – the same seeds that our ancestors grew in their garden and their farms and that’s an heirloom. Anything that is the original and has a history that dates back to about the century or more, that is what we consider heirloom. Jason Hartman: Are all of the seeds out there, virtually, nowadays? These hybrid seeds that are patented and controlled and won’t regrow? Still obviously people can buy these hybrid heirloom seeds through you, but if you go to buy them at Lowes or Home Depot, what are you getting? John Lipscomb: Yeah, that’s the real problem. Ever since about the 40s and 50s, heirlooms were phased out of the marketplace. So everything you see, and even farm and ranch centers, to Walmart, Lowes, Home Depot, all those seeds are basically hybrid seeds. And that’s what gardeners have been using for about 100 years. But there’s a new resurgence and we’re right on the beginning of it, and that’s people wanting to grow their own food and they’re thinking I want to go back and I want to grow what my ancestors had and I want healthy food and I want to be able to save the seed and then plant it again next year instead of having to go out and buy new seed year after year, which you have to do when you’re talking about hybrids. Jason Hartman: So it’s been that long – I didn’t realize this has been going on that long, for decades now, huh? So how do you get a hold of these heirloom seeds to resell them? I mean where do you get them? John Lipscomb: Wow. It accounts for about half of my day throughout the year, Jason. And I hunt down large gardeners and smaller farms that are certified into growing heirloom vegetables. And they are doing this for restaurants typically and I make a deal with them to ask them to put some of that back and sell the seeds to us. And so we’re buying directly from a small farmer typically. And they usually are in the Midwest, somewhere in California, but Iowa, Indiana, Pennsylvania, all over. And I even found one here in Kansas which is quite a surprise because where we’re located in the state of Kansas, there just isn’t much interest in heirlooms. They are so conditioned in some states to just grow hybrids. And then, of course, you get into the genetically modified, wow, that’s a nightmare. Jason Hartman: Yeah, this is pretty scary stuff when the powers that be really try to control the food supply like this. So heirloom seeds really got phased out then in the 40s and 50s you’re saying, right? John Lipscomb: Yes. It began at the turn of the century, 1905-1910, right when they were bringing in the big harvesting mechanized units to phase out the labor. The corporate farm moved in when the small farmers and his family moved to the city to get the industrial jobs and they left behind this land while investors put together their funding and they bought all this anchorage and it became a corporate farm. But because they were driven by profit and not maybe serving the health of the customers. They were focused solely on eliminating cost. And as most business people know right off, manual labor is your biggest cost. By going to machinery, they were able to eliminate that labor. Jason Hartman: And so the original thing behind the hybrid seed movement then was not necessarily a bad thing. I mean it was to make the fruits and vegetable more shippable, more assembly lineable, for lack of a better phrase, so that they would be tougher, so that they would last longer, and I mean that was good because people had more access to produce, right? John Lipscomb: Absolutely. And it also kept the cost down. But there was one other aspect to this and that was the corporate farms were selling to corporate retailers. The mom and pop grocery stores started to phase out between 1910 and 1950. And in came Dillon’s and Safeway and so on. So those grocery store sellers in the vegetable department noticed, their accountants actually were the ones to notice, that when they had heirloom vegetables all those years in the mom/pop stores, then the oddest shape, sometimes the smallest or sometimes the largest vegetable was left behind and there was waste. And so by teaming up with these corporate farms and saying, hey, can you give us tomatoes and melons and carrots that are all identically the same size, the same color? And they did. They did by manipulating the genetics in that seed. And so that’s where hybrids were all about. And so they were able to eliminate all the grocery store all that waste, Jason. And that was a good thing. Everybody’s making money on this, and even consumers are saving money early on. Jason Hartman: Yeah, because they could sell for lower prices. John Lipscomb: Absolutely. Let me put this out there, folks. We have been struggling in this country with obesity. We all that have had wives, that have had children, we notice that our wives will have a craving for a particular thing when they’re pregnant. Well, that is because the body is telling them they need something, some mineral, something in that food. Well, I believe, Jason, that’s what’s going on with obesity in this nation is that our bodies are screaming for healthy food. They’re not getting it through the hybrid and GMO foods and that’s why we’re eating more and more and more. Jason Hartman: Well, I think that’s very possible. The food is just kind of empty in other words, isn’t it? Jason Hartman: Yeah. So we had a guest on talking before about GMO food. And what you mean there is GMO is genetically modified organisms, so genetically modified foods. Tell us your take on the GMO problem. John Lipscomb: Wow. It started about 11 years ago with a crossed tomato with a fish. So you took an animal and a vegetable and at the molecular structure you united them. And it was a shocking revelation in science, and I remember it being on the news and everybody thought oh that’s just terrible. But they didn’t notice that they’ve been eating it ever since. Now, again, that was driven by the PNL on a financial statement on the corporate farm site because you had late frost and it would kill the tomato plants off. And so they said, well, there’s a fish out there that have a natural antifreeze in their DNA. Let’s take that from that animal and put it in with the vegetable so that it could survive 30 degree, 20 degree nights or early in the spring. And so they did and we’ve been eating it ever since. And now they’ve taken firefly, for whatever reason I cannot figure out, and put it with corn. Maybe they want the harvester to be able to see the corn late at night. I don’t know. But sometimes I think these scientists are just doing things because they can – they’re not asking the question whether they should or not. Jason Hartman: Yeah, good point. I mean we really don’t know the effects of the GMO situation, do we? I mean that’s just a lingering question, isn’t it? John Lipscomb: Yeah, sure it is. Jason Hartman: I want to say besides obesity is cancer. John Lipscomb: Yeah, there are some people that have done some research and seemed to be able to point that direction. But I’d rather just play it safe rather than sorry and eat healthy food. Jason Hartman: So talk about what someone needs to know about gardening and what they can do to really be self-sufficient. Of course buy heirloom seeds. What else is involved, though? There’s a lot more to it than that. John Lipscomb: Oh, sure. But it is a lot easier than what people think. We try to remember that the industrial revolution separated Americans from the farm. Over 60% of us were in the agriculture department. And then when we got to the 70s, we had 15. And today we’re 3%. Now, along with that it’s been a great drop in vegetable gardening. Matter of fact, during the depression, 80% of Americans were able to grow a garden. Today, currently, we have 2 to 3 percent Americans grow a vegetable garden. So there’s a detach from our own food. And I would say if we had an economic collapse today, we would be under a real mess because most people don’t have a clue of how to grow a garden. But it’s easier than you think. You’ve got to get out there in your own backyard. It doesn’t need to be a large area. There’s some efficient ways of growing a garden. Ray’s bed is probably the most popular. It’s what we’ve used for 21 years. And to get that soil built up in height above the rest of the ground so that the woods can go down rather than out and all the farmers in this country for over a century have been doing row farming and gardening, and the roads have to spread out. So they take a lot more area. So the other thing is to investigate organic gardening. Stay away from the herbicides and the fertilizers – we don’t need it. And once you add it to your garden, you’ll have to use more and more every year. And that’s part of the plan too with some of these companies that the herbicides. They’re getting you to buy more every year. What a scheme that is. So we really urge our gardeners that we serve to take these heirlooms and do organic gardening with them because then you really control the quality of a food. And there’s been a lot of comparison between organic vegetables and non-organic using chemical herbicides. And there’s a traumatic difference in the nutrition. And here at El Dorado Heirloom Seeds, one thing that we do, Jason, one of the first companies to do this, introduce trace minerals to the backyard garden. And these are the essential minerals that plants need and you need from the food that you harvest form the plant. And it’s great for human health and we have 67 varieties of vegetables. But we have 67 trace minerals in this prehistoric dirt that we have harvested down in Nevada. So I think it’s all about you feed the soil and the soil feed that vegetable plant and it will give you great healthy food. Announcer: What’s great about the shows you’ll find on JasonHartman.com is that if you want to learn about investing in and managing income properties for college students, there’s a show for that. If you want to learn how to get noticed online and in social media, there’s a show for that. If you want to know how to save on life’s largest expense, there’s a show for that. And if you’d like to know about America’s crime of the century, there’s even a show for that. Yep, there’s a show for just about anything, only from JasonHartman.com. Or type in “Jason Hartman” in the iTunes store. Jason Hartman: So what else should people know? Anything on the technical side? You include some DVDs with your packages and you mention Ray’s Bed farming. I mean how high should the bed be raised? You mentioned before when we were off the air you talked about worms. What are some of the more detailed parts of this? John Lipscomb: Yes, that’s a great point. We saw that there’s such a detach with American culture with their gardening, we thought we really gotta take them back to the basics. And so we have a DVD that will teach them how to do lasagna gardening which is a real innovative approach and raised bed gardening. And you really want to get that soil built up to about 9 inches above ground. Of course you want to rototill dirt underneath so that you have about 18 inches of good fertile dirt. We urge everybody to purchase the trace mineral soil from us in bags – you just sprinkle that out there. And as you water it or it rains, it’s going to go down into the soil rather quickly. And then we teach them how to raise worms. But we really, with organic gardening, you can introduce worms into that raised bed. And a handful of them will just do wonders to a Ray’s bed garden. Jason Hartman: And what will they do for it? I mean what do the worms do for it? Remember, you are talking to some people who are city slickers here. Because the next thing I’m going to ask you about is how to do this on a patio, how do you do it in compact space? But, first of all, answer the worm question if you would. John Lipscomb: Sure. The worms, I’ll tell you what – the first thing they do is they rototill on a micro level, just rototill. But as they consume the soil and compost and the matter that is in your raised bed garden, they are manufacturing it in their bodies so when it comes out it’s actually called black gold. But some people do harvest this dirt and then sell it and it sells for a lot of money. But they’re introducing microbes into it through their system. But I like to think of them as just miniature rototillers down in the earth. And by making the soil deep and arable, the roots are able to shoot down through there easily without fighting, without having to fight through that clay and any of that area. So that’s really important to have worms. And you can only have worms in your garden if it’s organic. As you’re spraying herbicides and all that, you’re gonna have a problem. In our kit also we have a solution called vegetable thrive. It’s also 100% organic. And all it is is a solution of microbes. And you just spray this on your garden. It’ll last you all season and these are microbes that go down in there and they’ll decompose all the matter and they’re a smaller machine than the worm. But it’s very important to have microbes in your garden because they stimulate the root system of the vegetable plant to triple in size. And now if you have the trace minimal that we sell in that soil also, think of this, you triple the root system and it’s able to pick up all these nutrients, all these minimals and bring it up to the vegetable. Once you get in effective, it’s a giant plant. You got a healthy vegetable. And it’s just nothing better than that than growing your own food. Jason Hartman: And how does someone do this on a small space type of issue? Urban gardening, what do people need to know about really making this compact and just ultra-efficient? John Lipscomb: Well, no matter where you are, you can grow your own food. You might not be able to grow a year’s worth but you can grow some. And I promise your listeners that once they get started on this, they’re gonna never stop because it’s just the funnest thing in the world. And to sit down and eat your own lettuce, you know, it’s a whole new experience. But whether you’re doing a raised bed that might be 4 feet by 8 feet long or many of those. And like my wife and I, we have about 40 of those. So we do a rather large Ray’s bed garden. Or you’re doing a container garden on your patio or perhaps a flat roof in a city. You can terra cotta pot or any kind of container, get up there on the patio or the roof and the urban cities, and as long as you have some good, healthy soil and some good, healthy seeds, you’re gonna be just fine. You’ll be surprised at how much you can grow, but just in a small one foot to 18 inch terra cotta pot. You could grow a rather large tomato plant that can provide you 30, 40, 50 tomatoes over the season. Jason Hartman: Speaking of which, what do you think about that upside down tomato planting system you see on the infomercials? Are those things just gimmickry or are they good? John Lipscomb: Jason, I saw that for the first time just recently and I laughed out loud, but I’ll tell you what, I’m open to it. I’m not gonna attack it until I’ve tried it and it doesn’t work. So it just might work really well. It did look amazing in the TV commercial. Jason Hartman: Okay, anything else about compact urban gardening styles? John Lipscomb: Well, it’s just real important when you’re doing container gardening to really be aware of the water. You need that soil, you need to have water moist there. And when it’s comes to container gardening, I really like to set a 5 gallon bucket of water out there and let it set 24 hours before I use it, because you’re in the city, most water is fluoridated and not a big fan of fluoridation and neither will your plants be. So it’s good to allow not only the water to aerate and get the chlorine out and all that before you use it, but just to have water on hand because a container garden will evaporate the moisture inside a lot quicker than a typical garden. Jason Hartman: Good stuff. Well, what else would you like people to know in closing, John? John Lipscomb: Well, Jason, just that whether they’re buying heirloom seeds from us or somebody else, I really urge them to do it. In this country, we need to take back control. Now, we can try to do that politically, but it just seems to not work. We go third party and that doesn’t work. What can we control? Well, we might not be able to control the politics from 1000 miles away, but one can control our own lives and what happens in our house, what we eat, and what we can grow right out our backyard. You don’t have to be out of the city. You can live right in the city. You can grow an amazing amount of food in a 12 by 12 area. And why we’re not doing it, I don’t know. But there is a huge turn towards this, Jason, and we’re really excited. We started off four years ago – just a tiny little business. I was putting seeds in envelopes on our dining room table and now we have 15 employees full time. And we’re thrilled with the business. We’re going to do right around 5 million dollars in the heirloom seed business this year. So it’s an exciting time, so Americans are waking up. And they are taking back control of their food. And nothing can be more important because we are what we eat, and if we’re eating junk then we’re junk. Jason Hartman: That’s fantastic. That’s very good advice. So what is the basic product or kit that people buy from you? And then give out your website of course. John Lipscomb: They can go to ElDoradoHeirloomSeeds.com and they will see a photograph, we just changed our website today and they’ll see a photograph there of our 67 varieties of heirloom seeds. Now these have been proven to grow in most every zone in the United States. We sell worldwide and they grow in Africa, the Asia area, we’ve sold to Russia, all over. But Canada and England areas is our biggest market outside of the United States. But they do grow everywhere. They’ve been proven to do that. 67 varieties, you might not like everything that comes in. If you’re not a radish person, well you don’t have to grow radishes. But there’s plenty to choose from and then we have a DVD showing you different ideas about gardening. We also have a book on CD that will teach the gardener how to save the seed every year so that they never have to buy from us again. And because the real motive for this company is to get America back growing their own food and being self-sufficient. We don’t want to be a Monsanto where we’re forcing you to come back every year to buy your seeds. We have a little sample of a thrive trace mineral there and a garden planter to show you when you need to plant your radishes or your onions and your tomatoes. We have a PH soil test kit so that it’s real important to have a good PH balance with your soil before you plant. If you’re too acidic, your seeds won’t grow. If you’re too alkaline, they’ll be a little sickly. So you need good, healthy soil and the PH strip will help you identify that soil. And goodness, Jason, that’s just about it. But we’re here to help. If people have questions, our phone numbers are on the website. We can’t grow the garden for them, but we’ve got everything there that they could possibly need. And it’s an exciting time for us. And, by the way, let me mention, on that home page if you just scroll down a few inches, you’ll see our brand new commercial which is done by Michele Beschen of PBS and HGTV. She’s a big fan of ours. And she came on board with the company and did a commercial for us. And we’re real excited about that. But she explains the kit in full, probably does it a little better than I do. Jason Hartman: Excellent. Well, good stuff. Well, John, thanks so much for joining us today and everybody listening, take back control of your food supply and don’t be dependent on the powers that be, the corporatocracy, the government, because you’re not gonna get a good deal from them. You gotta be in control, you gotta be self-reliant. John, we appreciate you joining us today. Thank you. John Lipscomb: Thank you, Jason. Narrator: Want to know what you’ve missed in the Creating Wealth series? Well, here’s your opportunity with Jason’s 5 book set. That’s shows 1 through 100 through digital download. You save $288 by getting this 5 book set. Learn all of the advanced strategies for wealth creation. For more details, go to JasonHartman.com.